Reap the benefits of all that a metal roof has to offer with Allstate Construction Roofing's expert installation. Allstate Construction Roofing specializes in the installation, repair, and replacement of metal roofs. By choosing a metal roof, you can save money while conserving energy and being more environmentally friendly. Metal roofs can also give you the look of other types of roofing materials without the disadvantages they often have. If you live in The Panhandle, Bonita Springs, Miami, Port St. Lucie, Orlando, or any town or city nearby, contact us today for a free roofing inspection. 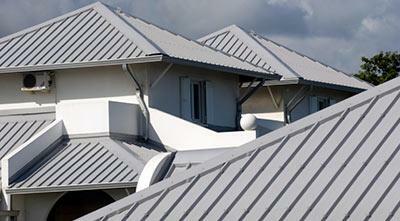 Metal roofing has unique characteristics that separate it from other roofing materials. Unlike asphalt tiles, shingles and slate roofs, metal can withstand most elements, weather conditions, and other impacts for long periods of time. When choosing to install a metal roof on your home, you are not only enhancing the appearance but its overall function and efficiency as well. Metal roofs surpass all other roofing materials in weather resistance, resistance to cracking, shrinking and eroding and their ability to remain energy efficient while protecting your home from severe storms. Our roof replacement services are available all throughout the Florida area, including The Panhandle, Bonita Springs, Miami, Port St. Lucie, Orlando, and nearby!